Lightfoot speaks at her campaign party in South Loop. Lori Lightfoot (J.D. ’89) won the mayoral race over Toni Preckwinkle (A.B. ’69, A.M. ’77) by a margin of nearly 50 percentage points on Tuesday night, closing off a historic runoff between two Black women, both of whom are UChicago alumnae. In addition to being the first UChicago alumna and Black woman as mayor, Lightfoot will also be Chicago’s first openly gay mayor. With 97 percent of precincts reported on Tuesday night, Lightfoot had 74 percent of the vote and Preckwinkle had 26 percent. Lightfoot, originally seen as a long shot in the race, increasingly drew traction shortly before the February general elections. In her campaign, she appealed to her status as an outsider unbound by the complex relationships of Chicago politics. The Associated Press first declared Lightfoot the victor less than an hour after polls closed at 7 p.m. on Tuesday evening. Around two hours after polls closed, Preckwinkle called Lightfoot to congratulate her. The two then spoke to crowds at their respective campaign parties. Tuesday’s runoff election, the second mayoral runoff in Chicago history, had dramatically low turnout. Chicago Board of Election Commissioners spokesman Jim Allen predicts total voter turnout to be near 33 percent, potentially a record low for a Chicago mayoral race. In 2007, voter turnout reached a historic low of 33.08 percent to re-elect Richard M. Daley for a sixth term as mayor. Many Preckwinkle supporters voiced concern over the low turnout. Lightfoot’s victory came as expected, based on polling leading up to Tuesday. A poll published last week showed Lightfoot with 53 percent of the vote and Preckwinkle with 17 percent of the vote. Lightfoot, former chair of the Chicago Police Accountability Board, was originally seen as a long shot in the race. She ran against candidates with more extensive political experience such as Preckwinkle, Cook County Board President and Fourth Ward Democratic Committeewoman, and candidates with more political connections such as Bill Daley, brother of former mayor Richard M. Daley and son of former mayor Richard J. Daley. Lightfoot gained popularity in the weeks leading up to the February general elections, emphasizing that as a political outsider, she did not have relationships that her opponents do that would make her “beholden to any political party or any unions.” She tied with Preckwinkle and Daley in a poll conducted the weekend before the general elections, and led the race with 17.5 percent of the vote in the general elections. Following the general elections, seven out of the 12 defeated mayoral candidates lined up to endorse Lightfoot, while none of them endorsed Preckwinkle. The Chicago Sun-Times editorial board had endorsed Lightfoot prior to the general elections and the Chicago Tribune editorial board endorsed Lightfoot several weeks after the general elections. Lightfoot graduated from the Law School in 1989. While she was there, she served as student body president and worked to ban a law firm whose recruiter had made racist and sexist remarks to a Black female student. After law school, she served various positions in the private and public sector, including federal prosecutor, president of the city’s police board, and partner at Mayer Brown LLP. Critics have noted that Lightfoot has never held elected office before. Leading up to the runoffs, Preckwinkle emphasized her extensive experience serving as an elected official. Before her terms as Cook County Board president starting in 2010, Preckwinkle served as Fourth Ward alderman for five terms. “It’s easy to talk about change. It’s hard to actually do it. And that’s been my experience—being a change-maker, a change agent, transforming institutions and communities,” Preckwinkle said while campaigning. Preckwinkle has also implicitly criticized Lightfoot’s lack of experience, claiming that mayor is “not an entry level position.” Lightfoot refuted criticisms that she would not be prepared to serve as mayor, claiming that her wide experience adapting to different jobs makes her qualified. Lightfoot, who will be Chicago’s first openly gay mayor, campaigned on improving LGBTQ+ participation in city government as well as increasing safety for LGBTQ+ community members by introducing police training and hate crime investigations. 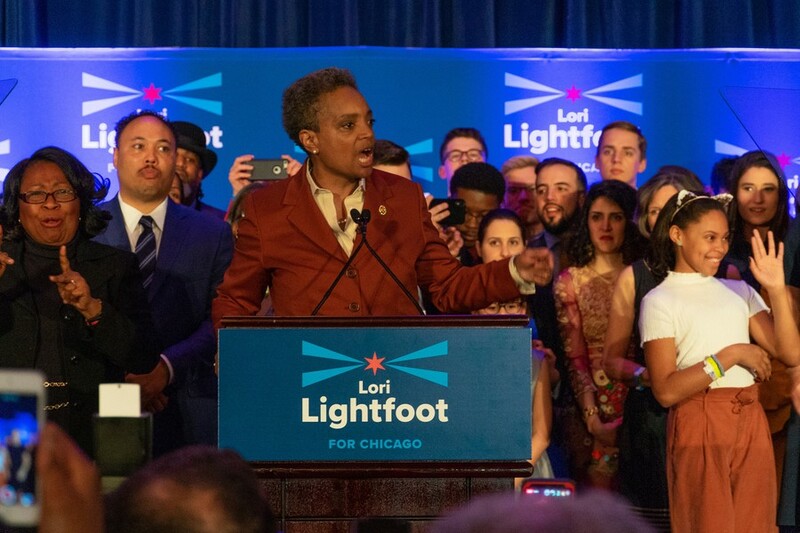 Before Lightfoot’s appearance on stage at her campaign party, UChicago third-year Sarah Lewis emphasized Lightfoot’s status as the first openly gay mayor. Despite Lightfoot's social policies, some question whether Lightfoot would be a progressive choice for working class Chicagoans, having been a former corporate lawyer who defended banks, pharmaceutical companies, and other multibillion dollar industries. Lightfoot also raised concern among voters due to her policies surrounding policing, who criticized her for her past experience as federal prosecutor and chair of Chicago’s police board. Two weeks ago, Chance the Rapper endorsed Preckwinkle, citing his concerns over Lightfoot’s past history as a prosecutor. Chance’s sentiment was echoed by others at Preckwinkle’s election night party, such as a county employee who wished not to be named due to their employment. On education, Lightfoot said in answers to a questionnaire by Chalkbeat that she supports a fully elected school board. Chicago’s school board is currently fully appointed by the mayor. Asked if she would keep in power Janice Jackson, the current Chief Education Officer heading the school board, Lightfoot did not give an answer, saying she would “sit down with Dr. Jackson to discuss my vision and expectations for change.” Turnover on the school board, particularly for the Chief Education Officer, could entail changes to how the school board allocates resources to schools across Chicago and the school board’s handling of charter schools. Lightfoot has also been circumspect—as has Preckwinkle—about how she would deal with the city’s pension crisis. Lightfoot told the Chicago Tribune that she would address the pension problem through “progressive sources of revenue” and by cutting the size of city government via measures like eliminating the city treasurer’s office and city clerk’s office. She chanted, “Let it shine, let it shine, let it shine,” referencing the song “This Little Light of Mine” and her last name. Lightfoot will officially take office as the new mayor on May 20. Update April 2, 11:37 p.m.: The article has been updated with additional quotes from people at the campaign parties.